Peel the pears. Put them in a small saucepan with the cinnamon, 1 tablespoon sugar and enough water to cover them. Cook on medium heat with the lid cracked, until they soften. The amount of time will vary depending on the type of pear. Test it with the tip of a sharp knife. When you feel they're soft, turn off the heat. Cool the pears in the cooking water. You can do this the night before. In a skillet on medium heat, heat olive oil. Add pecans and fry them. When they start browning and becoming fragrant, sprinkle with 1 tablespoon sugar and stir constantly until the sugar dissolves and becomes liquid and golden. Turn off heat and put pecans on a silicone mat or wax paper. Let it cool. You can do this in advance and store the pecans in a tightly covered jar, alternating between layers of wax paper. 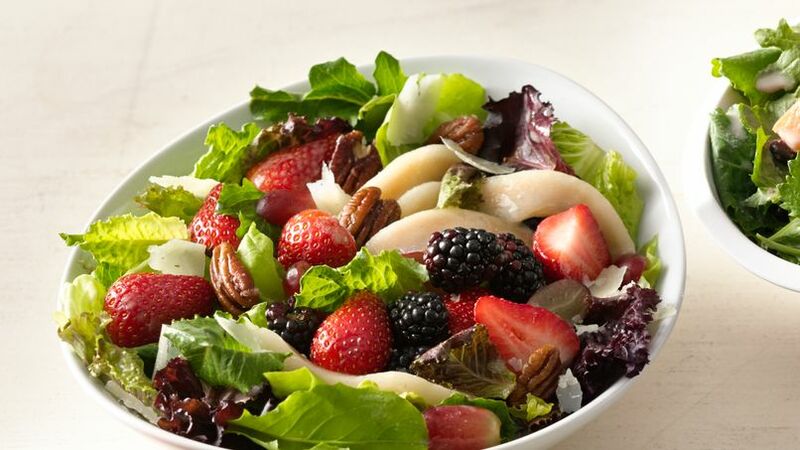 To make the salad, put lettuce, strawberries, blackberries and grapes in a bowl. Add pears cut into wedges and Manchego cheese. Mix and set aside. In the meantime, make the dressing by mixing all the ingredients and whisking to combine. Dress the salad, and top with fried pecans. Use seasonal fruit to make the dish more varied and fun. Instead of pears, you could use peaches, orange segments, mango, melon... it's up to you. You could replace the Manchego cheese with another cheese that you like better. Mozzarella is a good option, but Gouda or a blue cheese will be just as tasty. You could substitute the lettuce with baby spinach, arugula or romaine lettuce. Morena Cuadra Fruit, lettuce, pecans and cheese... what else could we ask for in a salad, so it's delicious and keeps us energized to continue with our daily activities? I've been a fan of all kinds of salads for years. I like adding different ingredients and textures. One of my favorite combinations is sweet and savory, since in addition to contributing to my daily dose of fruits and vegetables—each in a different color—I feel that they're good for my body, without being excessive. This little salad is easy to make. You can even use canned pears to facilitate the preparation. What I do recommend is "frying" the pecans at home, because the results are spectacular and it won't take you too long.